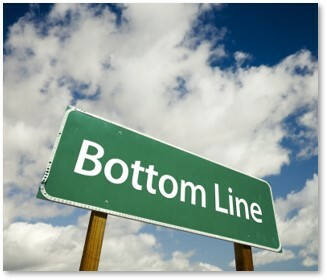 Periodically, we are subjected to a revival of political and economic myths that have been proved wrong over and over. These include the Laffer Curve, supply-side economics; tax cuts for the rich to stimulate investment, job-killing regulations, and trickle-down economics are good examples. 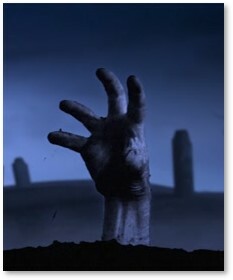 Even with the stake of reality thrust through their hearts, they rise from the dead like zombies with every GOP administration. Another such zombie myth is self-regulation. I raise the issue now because the current GOP administration is doing its best to eliminate government oversight and extend self-regulation wherever possible, including into our food supply. And that might be right if corporations were run by computers. Or if companies and industries had an actual duty to protect the public, safeguard the American economy, and keep the environment clean. Big if. Companies have a fiscal responsibility to their shareholders and to the bottom line. That’s it, baby. And they aren’t run by computers or artificial intelligence, which would at least calculate the costs, the risks and the potential downside before making a decision. Instead, they are run by human beings, mostly men, who are subject to all the problems, temptations, idiosyncrasies and foibles of any homo sapiens sapiens. Those include greed and denial. So, anything that gets in the way of pumping up the bottom line—like government regulations, restrictions, and oversight—becomes just an obstacle along the way to bigger profits. Let me be clear: I am not criticizing capitalism. To paraphrase a baseball quote, “Capitalism has been very good to me.” I have no wish to repeal capitalism and replace it with some other system. But years of working for both large corporations and small start-up companies have left me clear-eyed about the realities of our current system. One of those realities is that corporate executives often take big risks, cut corners, compromise safety, and corrupt the environment if that gives them a chance to increase profits. Worse, the smartest guy in the room is often not as smart as he thinks he is. The Dunning-Kruger Effect thrives in corporate boardrooms. The history of these decisions, along with their consequences, is a long and gruesome one. Just to jog your memories,I offer a partial list of disasters that happened when corporate executives chose to maximize profit even if ti meant compromising public safety or polluting the environment. There are, of course, many more examples and these few are only the ones that have generated the most news. You may have others burned into your memory. Keep in mind that not all casualties happen immediately in a disaster and not deaths happen right away. “Only” 50 people died right away from the nuclear meltdown at Chernobyl but the real death toll added up over the years. The Deepwater Horizon accident killed “only” 11 oil rig workers but polluted the Gulf of Mexico for years. News reports focus on deaths but not on how many lives are changed by injuries and their effects over time. Those affected include families, businesses forced to close down because of pollution (Gulf shrimpers) or small Mom-and-Pop shops that have lost their customers because the factory that employed them blew up. The proof that regulation works lies in the number of deaths in this chart. 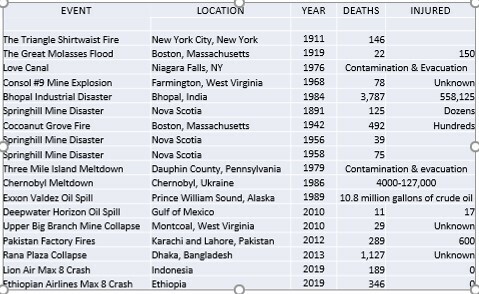 Far fewer people have died in the United States than in Chernobyl, Bhopal and Bangladesh. Companies here do their best to get around regulations, violate rules, and cut corners but those rules and regulations still exist. In third-world countries, they often have no regulations to ignore. US companies sometimes choose to do business overseas specifically to avoid American regulations on pollution, working conditions and child labor. Sometimes, American companies like Boeing and Union Carbide cause devastating loss of life in other countries. Boeing was allowed to participate in certification for the Max 8 jetliner and the result is 535 people dead. There could easily have been more. The Brookings Institution is tracking deregulation in the Trump Administration and you can read the updated list for yourself. The latest bright idea from the GOP administration is to let pork producers take over much of the federal responsibility for food safety regulations. Right. Because the American food supply has never been contaminated. (sarcasm alert) The U.S. Food and Drug Administration lists 16 different outbreaks of food-borne illness in 2018. Remember, the federal government started inspecting meat-packing plants in 1906 to prevent unsafe and unsanitary practices by the industry. Among other outrages, Armour & Co. was selling rotten meat to the U.S. Army. Soldiers in the Spanish-American War fell sick and some died from ingesting what was, essentially, carrion. My ethical principle on self regulation by the pork industry is to trust no one. I would rather have the FDA make sure my pork chops are safe to eat. Sometimes we learn from our mistakes. The Cocoanut Grove fire changed fire laws and safety regulations around the country, for example. Now, however, the GOP Administration is trusting industry to regulate itself. We are not learning from history and I am concerned that we will repeat it. I think I will take those pork chops right out of my diet. The bottom line is that we can have either “job-killing regulations” or people-killing disasters. As a country, we have to choose what is most important to us. We cannot act on that directly — we trust our elected officials to do that for us. What we can do is vote for the party and the candidate that prioritize human lives over corporate profits. This administration has made its priorities clear. Everyone has a say. You just have to use yours. We can all work together to slay the zombie myths once and for all. 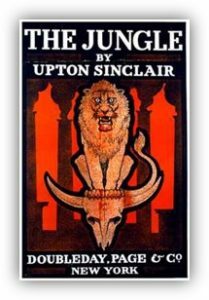 This entry was posted in Health & Safety and tagged Brookings Institution, capitalism, casualties, deregulation, disasters, Dunning Kruger Effect, Food and Drug Administration, inspection, job-killing regulations, meatpacking industry, muckraker, people-killing disasters, pork producers, self-regulation, The Jungle, Upton Sinclair, zombie myths by Aline Kaplan. Bookmark the permalink.